Bought this love crystal brooch as a Valentine's Day gift and your friend will loved it! Very beautiful and full of sparkle. The size is perfect! The stones sparkle so nicely.t's the best gift can give. 4.Please wear carefully, do not scrub it or make it fall to the ground. Novelty Heart-shaped brooch one side of the heart is paved with 2 rows of clear crystals,the other side is made up of 3 pink pearls and small crystals . Pink pearl brooch use sophisticated Technology elaborate inlay craftsmanship,shining and smooth,can keep long time retention;18k rose gold plated or platinum plating shining and smooth,can keep long time retention. add a uniquely feminine touch. With a true artistic feel, this trendy crystal pin is a fun and light hearted design you'll love to showcase. 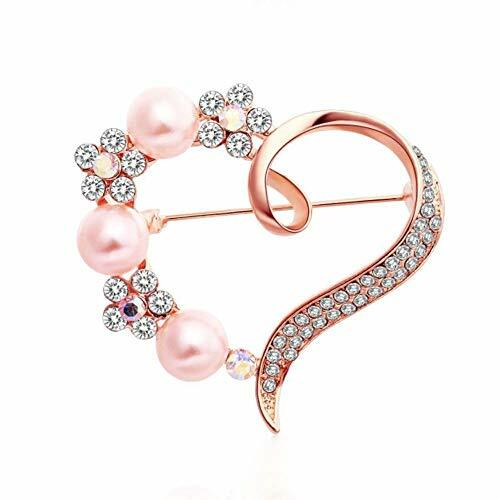 Own this masterfully crafted and vibrant pink pearl lapel pin brooch. This heart crystal brooch measures nearly 1.77*1.77 inches,weight:8.0g. it is not too big,perfect for pinning scarfs,hats,coat lapel or just as a decoration on an outfit.It comes in pink pearl or white crystal rhinestones on a rose gold or silvery tone accent. Free gift box,fashion pearl love brooch pin make a great gift for Mother's Day, Anniversary, Wedding, Birthday, Christmas, Valentine's Day, Graduation Gift for Sister, Mother, Mom, Grandmother, Daughter, Wife, Girlfriend, Aunt, Female Friend or Treat Yourself gift. If you have any questions about this product by TULIP LY, contact us by completing and submitting the form below. If you are looking for a specif part number, please include it with your message.